Jack Nicklaus 2004 18 72 7015 40 minutes from Patong Beach. 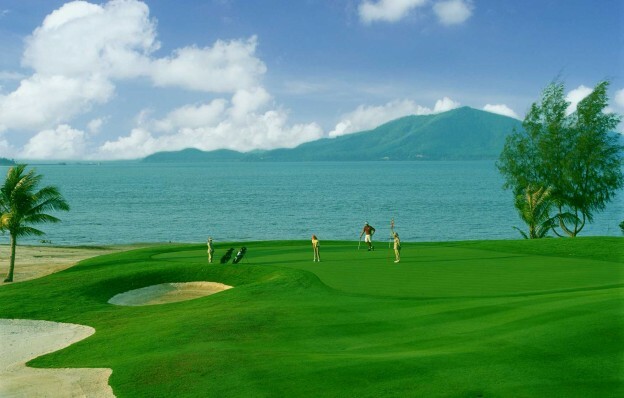 Phuket’s first 21st Century championship course lies on the scenic north-east coast, designed by Jack Nicklaus Mission Hills is without a doubt one of his masterpieces and a challenging and an outstanding golf course. The course might be by the sea but it is not a links course. It actually bears no similarity to other courses on the island but probably reflects Phuket’s character most accurately. Mission Hills Phuket golf course has two ocean holes and many ocean views, the Par 4 5th hole plays to an island green from an island tee in a huge sandy waste near the beach with a strong elevation change that runs through the middle of the fairway. Jack Nicklaus has added some distinguishing quirks, like the two greens that offer alternative finishes on Hole 18, a nine-hole night golf course, is also close by in the foothills. The courses are 10 minutes’ drive from the airport and 30 minutes from Phuket City.